Back in April I took a too-brief trip to Alberta, Canada because of you-know-why. We drove west out of Calgary, up the Icefields Parkway through Banff National Park and Jasper National Park, then east along the Yellowhead Highway to Hinton. I posted a set of pictures from the trip on Flickr. Here I've posted a few panoramas to whet your appetite. One of my hobbies is stitching strings of photos into panoramas. I got hooked on this when I lived in the Mojave for a season. The long, flat horizons are difficult to express in a single shot. A long, flat panorama captures the scene better -- gives the viewer a more immersive experience in the environment, just as it was for me when I was there. Also, why get an image of just one mountain when you can get an image of four? This is one of my best, I think, just for the scene. The funny things about Athabasca Falls is that when we visited it last year, it was absolutely swarming with people -- tons and tons of people. Thanks to an unexpected snowstorm on the way up, we had the place to ourselves. Hooray for quietude. Also, that blue, just-melted-from-a-glacier water is amazing. All of these panoramas were created in Hugin. It is a fine piece of software that you should use if you get the itch to create panoramas yourself. 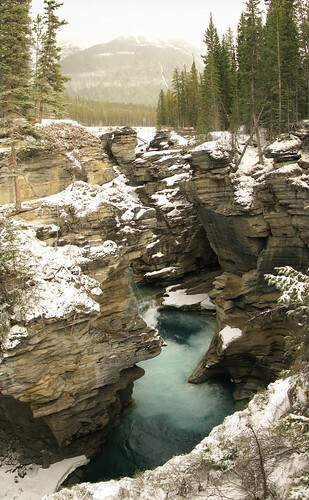 This entry was posted in Travel and tagged Alberta, Canada, Jasper National Park, panoramas on 2010-06-19 by kirk.kittell.